Members of the D.O.V.E. Fund are busy preparing for their annual dinner auction which will be held on Saturday, August 24th, 2019 . This year's event will again be held at the Pinnacle in Maumee, Ohio. A cocktail hour will allow guests to browse among the many live and silent auction items before sitting down to an elegant dinner. Back again from last year will be the familiar face of WTOL-11 TV, Jerry Anderson who will again serve as guest auctioneer. D.O.V.E. Fund Trustee Jill Grimm and her team, are busy putting together the wide range of items that will be available to the highest bidder. "From fishing trips, vacation and golf packages, jewelry and other special gift items directly from Vietnam. Jill reminds us that "We will have a little bit of everything this year, feeding everyones shopping excitement." "This event is the highlight of the year for the D.O.V.E. 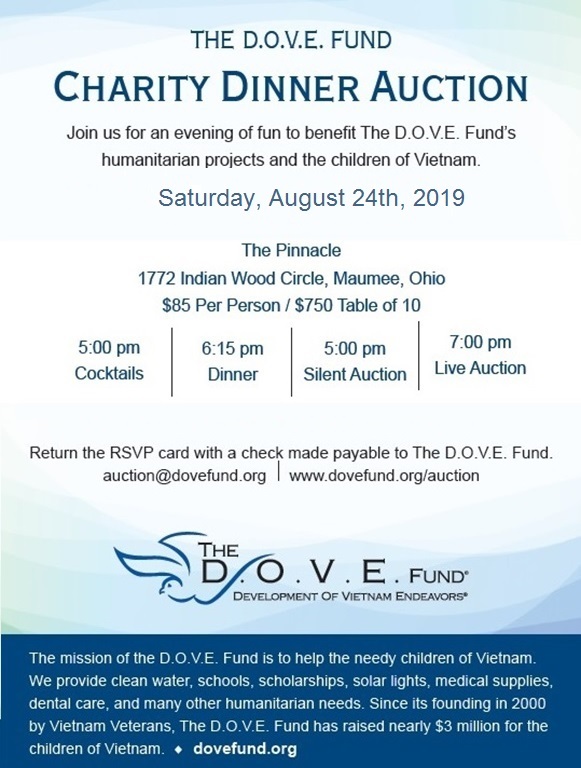 Fund," says Co-Chairman, Fred Grimm, a Vietnam Veteran who served in Vietnam, and has made 18 return trips to Vietnam to support projects for the D.O.V.E. Fund. Fred is upbeat about the future of the D.O.V.E. Fund and always working to coordinate new projects we can support. "We continue to see their needs for fresh water, medical clinics, solar lights, Education, Micro-Finance programss and much more." Auction attendees will also be asked to support the D.O.V.E. Fund's Scholarship Program. "There are so many deserving students who benefit from the donations of our generous donors," added Fred. "It's good knowing that educational opportunities provided by the D.O.V.E. Fund will help build a firm foundation for each of our scholarship recipients." This Event is Open to the Public.... Advanced reservations are required. call Dan Gregg at 313.330.6355 for more information.